Are your gums red or bleeding? Do you have one or more loose teeth, or are the gaps between your teeth widening? Do you have difficulty chewing hard or chewy foods? Are you embarrassed or unhappy with your smile? If the answer to any of these questions is yes, dentures may be the right solution for you. There are two types of dentures: full and partial. Full dentures are given to patients when all the natural teeth have been removed. 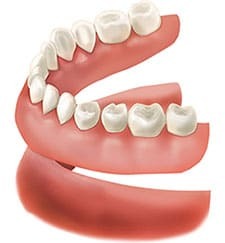 Partial dentures are attached to a metal frame that is connected to your natural teeth and used to fill in where permanent teeth have been removed. Just like natural teeth, dentures need to be cared for. Use a gentle cleanser to brush your dentures, always keep them moist when they’re not in use, and be sure to keep your tongue and gums clean as well. Please feel free to call us (or use our form below) and ask any questions regarding dentures and your current oral health. We look forward to hearing from you!